– Yes, we require a reservation for all adventures. What if I am a Felon? – If you are a convicted felon you are NOT allowed to participate in the shooting portion. We require that you sign a document stating that you are not a convicted felon at time of pick up. Can I Bring Food on the Shuttle? No, please be sure to eat prior to your scheduled pick up time. There are no food or drinks allowed on the tour shuttle. Lunch is included with all packages and will be served after your activity. Do I need to bring my Photo ID and Credit Card? – Yes, Photo Identification and the Credit Card used to make the reservation is required for verification purposes. – Yes, we require full payment in advance to secure your seat on tour with us. Are packages priced per person? – Yes, all packages are per person priced. Can you share packages with another person? – Packages cannot be shared with someone else. – We recommend booking your adventure as far in advance as possible. We have only 14 seats available on each tour and we do sell out quickly. The sooner the better, in order to secure your preferred day and time. Do I need a license or special permit to shoot? – No, you will only need to bring a valid photo ID or Passport. Do I need experience shooting? – No, we are happy to accommodate both first time and experienced shooters. – Yes, due to a safety concern pregnant women are not allowed to shoot. Please consult with your doctor if you have any disabilities. Can we schedule our own pick up time? – If you would like a custom pick up time you can purchase a private shuttle for an additional $500. – No, we are a private gun range and we only rent out our weapons. – Yes, we require close toe shoes. Please dress comfortably for the occasion. – Please bring a Photo ID and a back pack for any personal items such as wallets, keys, hats, sunglasses, etc. Yes, we highly encourage you to take pictures! – There is a $50.00 cancellation charge per package for all cancellations made more than 30 days prior to your adventure. There is a $250 cancellation charge per package for all helicopter combination packages for all cancellations made more than 30 days prior to your adventure. There will be a 25% cancellation charge of the total cost for all cancellations made within 30 days. There will be a 50% cancellation charge of the total cost for all cancellations made within 2 weeks. There will be a 75% cancellation charge of the total cost for all cancellations made within 1 week. No refunds will be issued for cancellations made within 72 hours. Can I upgrade my shooting package on the day? – Yes, you can upgrade your shooting package on the day of your adventure. We recommend upgrading before your arrival. Can I add on extra ammo? – Yes, if you like to shoot another weapon or buy more ammunition you can do so. – The minimum age to shoot is 12 years old and 5 feet tall. All children under the age of 12 can participate as a non-shooter. The minimum age to drive the ATV, Dune Buggy, or Razor is 16 years old. All children under the age of 16 must ride as a passenger with the tour guide on the 6 seater UTV. Is there a vegetarian option available? – Yes, our vegetarian option is a veggie sandwich with fries and a soda. 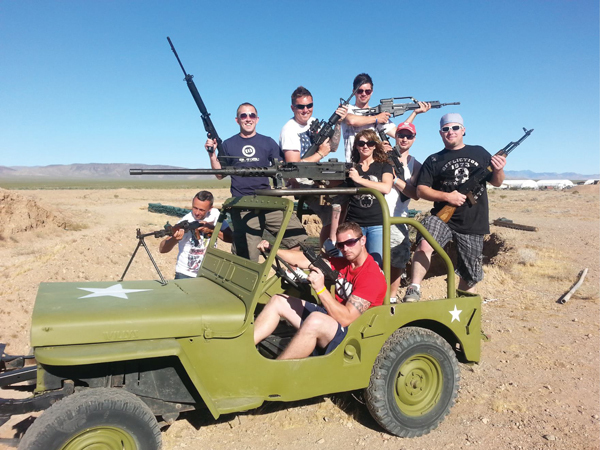 Disclaimer: Las Vegas Outdoor Range only operates transportation services, facilitates payment and reservations. 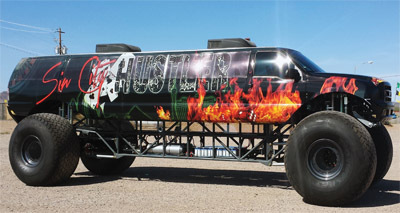 The Arizona Last Stop is the location where lunch is served and the location of the monster truck and gun range which are owned and operated separately. Any combination package that includes a helicopter or atv are also owned and operated independently at offsite locations not associated with Bullets and Burgers. Shoot from a helicopter packages: All flights are provided by Vertical Aviation LLC.